At GROHE, we appreciate that interior design preference is subjective. For some, only the latest architectural styles will do, while others desire a more traditional aesthetic. This is why we produce such an extensive range of faucets – to ensure all of our customers’ design preferences and installation needs are fulfilled. For consumers, too much choice can sometimes be overwhelming. To make their purchasing decisions easier, GROHE faucet collections are arranged into three distinct style groups: Cosmopolitan, Contemporary and Authentic. Each style segment relates to a different interior style and directs the consumer to the faucet collections that best reflect their design preference. 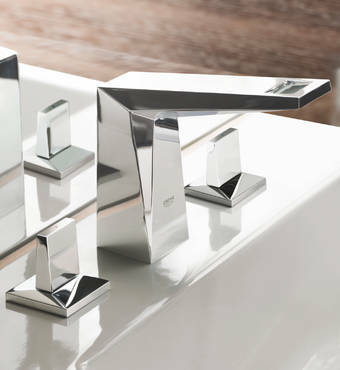 Refined and honest, Cosmopolitan faucets are a meticulous balance of design and functionality. Influenced by Minimalism and modern architecture, they fuse bold geometric shapes with advanced engineering. As the bathroom evolves from a purely functional space to an emotional and relaxing environment, the unique designs found within our Cosmopolitan collections ensure there is a faucet to enhance every style of basin or bath. Floor-standing bath spouts give you the freedom to place the bathtub anywhere within the space – creating a sculptural centerpiece, while wall-mounted basin faucets fuse seamlessly into the surrounding architecture. Contemporary collections unite timeless design with practical features to create an inviting bathroom perfect for families. Robust and reliable, faucets balance softer lines and established quality with easy-to-use features – effortlessly harmonizing with bathroom ceramics to create a welcoming environment. The result is a functional and comfortable space, which will to withstand passing trends and last a lifetime. Inspired by the refined details of classic architecture and traditional interiors, Authentic collections combine the design aesthetics of the past with the technology of today. 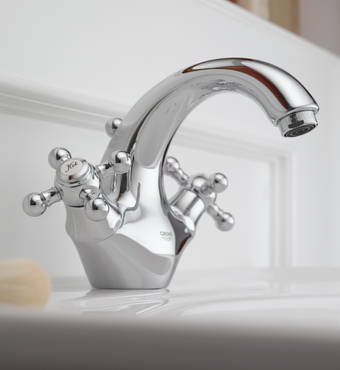 Created to provide a comforting and nostalgic atmosphere, taps and fittings harmoniously blend decorative accents with advanced engineering to enhance period-style sanitaryware and baths. 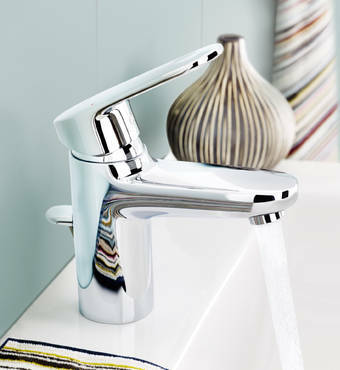 Three-hole basin taps are the perfect choice for an Authentic bathroom – traditional in style yet comfortable and convenient to use.